All the information I have right now is showing that the upgrade will go ahead this month @pendaws. You're connected to the Fairfield3 CMTS, which is one of our higher priority upgrades. I can't give you an exact date but the schedule I have shows it will be completed this month. Sorry for the delays! Here we go, this was taken less than 5 mins ago from Ookla. Another thing that gets me is, that I have NOT been able to view ANY content that is supposedly provided with the fetch thing, totally useless. I have, like the previous poster, lodged a complaint with the T.I.O. and will see what they can do to make Optus responsible for the horrid service I have been receiving since April of this year. I am amazed that Optus is still touting this offer of a "broadband" service with fetch that a lot of people will NOT be able to use, shame, shame, shame Optus. 17 years a customer and the "service" has gone to the dogs. 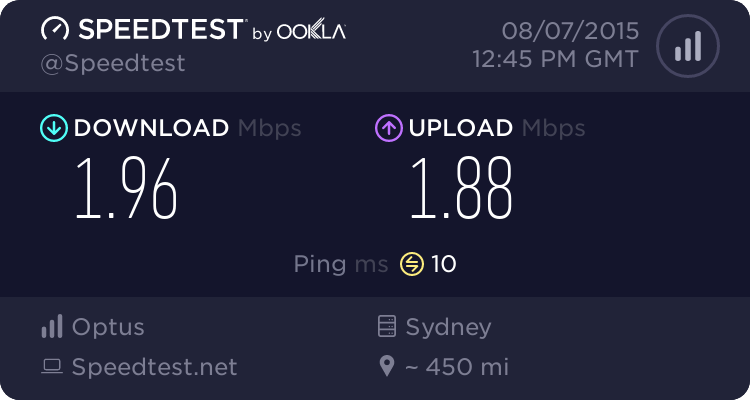 Here is the speed taken 3 minutes ago, nothing has changed so, when is the change coming? I am sure that you people WILL be hearing about this from the TIO soon. On the Network Status page there has been 2 or 3 "investigations" and still no fix. Can we have an update on the status of Fairfield's upgrades?